Tired of wasting time creating documents that no one will ever read? Spending hours fussing with documents to make them “perfect” only to find out that they didn’t include the right content? Spinning your wheels updating documents to keep them current? Modern agile management practices propose techniques to operate our businesses more efficiently, to be responsive to changing needs, and to greatly improve our throughput. Agile Documentation is composed of a set of practices that will help you document only the necessary things, in the most efficient way, for exactly the right audience, and in a way that minimizes ongoing updates. 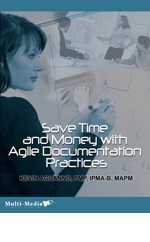 This recording will teach you how to save time and money while still producing quality documents, the agile way.